Alta Ski Area is world renowned for having excellent snowfall combined with some of the most diverse and challenging terrain in North America. Located about a mile up the road from Snowbird in the Little Cottonwood Canyon, Alta Ski Area features 2,200 acres of skiable terrain and averages 560 inches of snowfall each season. Alta is one of the oldest ski areas in the United States and has been spinning the lifts since 1939. 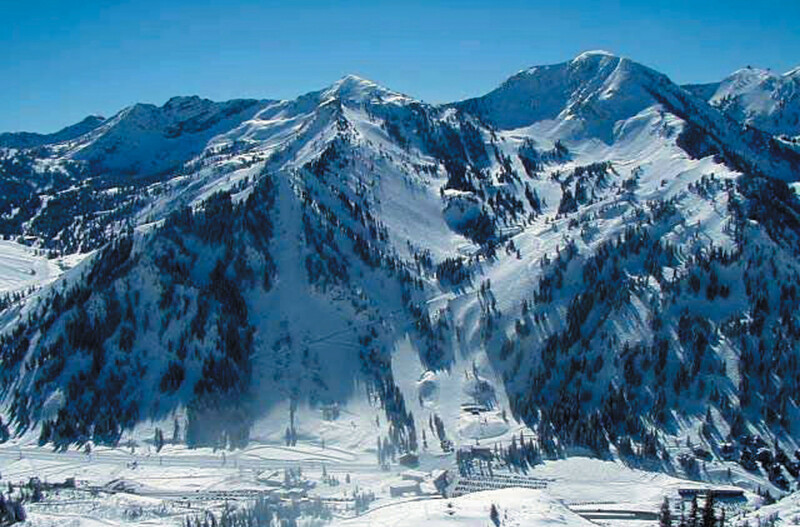 Alta Ski Area restricts access to skiers only. Located up the Little Cottonwood Canyon within the Wasatch-Cache National forest in Utah, Alta Ski Area receives abundant snowfall due to a unique microclimate surrounding the area. The snow is extremely dry and light and has been heralded as The Greatest Snow on Earth®. The terrain at Alta is a skier’s dream with spectacular scenery, great powder and amazing steep lines. With over 2,200 acres to explore, Alta offers up a wide variety of unique natural features that are world renowned and should be a must-ski for any serious skiing enthusiast. Alta also has some great intermediate and beginner terrain that sometimes gets overlooked. There is no differentiation between black diamond and double black diamond terrain. Skiers should scout lines from the chairlift before heading into unknown territory. Alta Ski Area and Snowbird Ski and Summer Resort offer the Alta-Snowbird Pass which enables skiers to access both resorts' terrain. A connection gate at the saddle separating Alta's Albion Basin and Snowbird's Mineral Basin is used to move between the two resorts.